There are few places on the planet that possess the same sense of mystery and wonder as Easter Island. Rapa Nui, as it’s also known, will surprise you at every turn, from the scale of the ancient Moai carvings (“big heads”) that adorn the island, to the diversity of the landscape. Here you’ll find rugged coastlines, jaw-dropping volcanic formations, and peaceful grasslands that grace the interior. Wild horses rule the land while birdlife soars above. With this kind of remoteness comes some of the world’s darkest skies and an “end of the world” feeling like you’ve never experienced before. 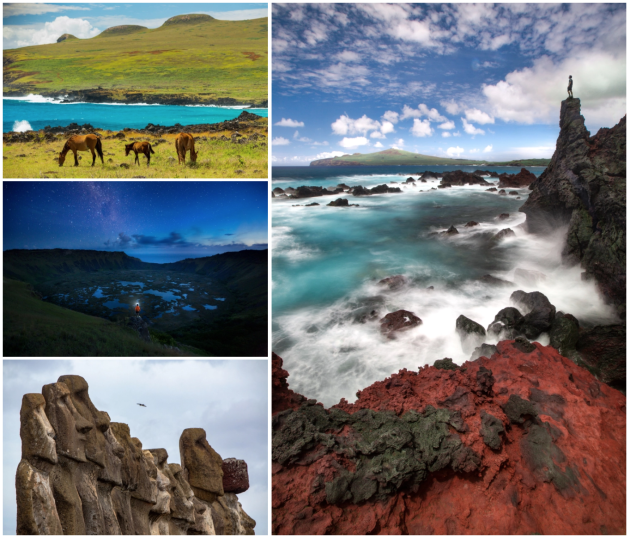 Combined, these elements provide an unforgettable experience for photography of all kinds, and a rare opportunity to see first-hand why Rapa Nui’s monoliths remain one of the world’s greatest mysteries. We’ve done the groundwork to offer you the most comprehensive and memorable photo experience possible. The event will run from March 23, 2020 at 4PM through to approximately 10AM on March 29, 2020. A detailed itinerary will be released to participants well in advance of arrival. Payment options: Full payment or CAD $1650 non-refundable deposit to secure a space with three installments of CAD $1600 due July 31, September 30 and November 30. Holding a passion for the world and an eye for the beauty it contains, northern commercial, personal, and landscape photographer Dave Brosha is on a continual journey to seek out and capture the beauty of this world – whether it’s the beauty of some of most extreme and pristine environments in the world, or the beauty of some of a person’s most personal moments. In addition to living throughout northern Canada for much of his life, Dave – along with his wife and children – have also lived in Asia and have traveled extensively through both the many provinces and territories of their native country and numerous countries abroad. Dave’s personal affiliations and representations include the First Light agency, Aurora Images, Offset, Getty Images (stock), National Geographic (stock), and the Canadian Press, for which Dave is a freelance photographer. Specializing in photographing in difficult conditions and hard-to-reach places, Paul has a passion for shooting alpine sports and backcountry experiences, capturing the spirit of adventurers and finding unusual angles of common mountain subjects. As a landscape photographer, he particularly enjoys the challenge of capturing nature’s beauty at night and the unique features that come with a dark sky – stars, Northern Lights and dramatic silhouettes. Paul’s award-winning photos have been featured in a variety of publications, including IMPACT, Alpinist, Canadian Geographic, Islands, PhotoLife, Fodors.com and explore magazine. In addition to his work for a number of clients, over the past few years Paul has created a signature collection of images for Banff Lake Louise Tourism, which are used to promote Banff National Park throughout the world. In the Canadian Rockies, Paul has hiked extensively in the backcountry and photographed from the summits of countless peaks. His adventures abroad include a 1400-km unsupported double-crossing of Iceland on foot (2004), which is believed to be the first of its kind, and a 1488-km solo crossing of the South Island of New Zealand (2007). Recent travels have taken him backpacking in the Caribbean, exploring tiny insular nations of the Pacific, trekking in remote corners of Scandinavia and Nepal, and ski touring on Baffin Island. CANCELLATION: Spots are non-refundable but are transferable, with the exception of a $250 administration fee. For instance, we will provide a refund, minus the administration fee, if the participant is able to find someone else to take his or her spot and can sell/transfer the spot to a new participant. Please contact us at erin@offbeatphoto.ca to make arrangements. Although extremely unlikely, OFFBEAT Photography Inc. reserves the right to cancel the tour at any time for a variety of reasons (i.e. if a minimum number of participants is not met or if unforeseen circumstances dramatically impacted cost of the tour or global conditions somehow warranted a cancellation). In the very unlikely event of a cancellation, all monies/deposits made to OFFBEAT Photography Inc. would be refunded to participants, however, no compensation would be made for participant flight cancellation fees or any other associated travel costs. See Insurance Policy for more details. INSURANCE: It is not only advised but required that workshop participants have trip cancellation/interruption insurance, as well as emergency medical/illness insurance and rescue coverage (proof required within 4 months of departure). Weather and other unforeseen factors can cause delays in travel, particularly from some of our more remote locations. It is the participant’s responsibility to cover any costs in the case of a travel delay of any length. Please ensure your trip cancellation/interruption insurance accommodates this possibility. By purchasing a spot you are acknowledging that you accept these conditions.